While V-E Day (Victory in Europe) was proclaimed “the celebration heard ‘round the world,” it was only a temporary reprieve for Harold Geisinger. This 19-year-old Iowa farm boy from Storm Lake was on his way to Le Havre, France, with the U.S. Army when Germany surrendered unconditionally to the Allies on May 7, 1945. After a low-key celebration, Geisinger and his fellow soldiers boarded a box car in France bound for Hanover, Germany. 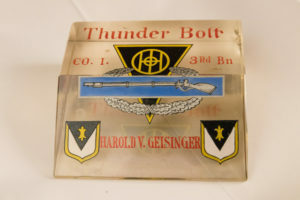 Geisinger then joined a convoy in Bavaria, the section of Germany where American troops were guarding railroads, train depots, irrigation sites and more. While the war was over in Europe, fighting continued on the other side of the globe. In the summer of 1945, there was talk that Geisinger and his fellow soldiers would likely be on board the next U.S. military ship bound for the Pacific Theater. Everything changed, however, when Japan surrendered on Sept. 2, 1945, following President Harry S. Truman’s orders to drop two atomic bombs on Japan in August 1945. 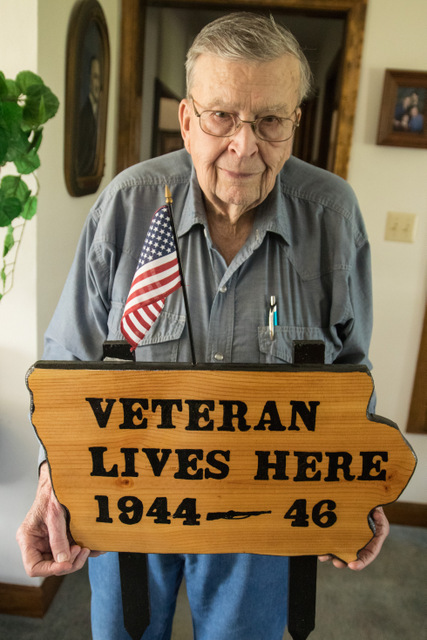 After graduating from Storm Lake High School in 1944, Harold Geisinger was drafted into the U.S. Army on Aug. 2, 1944. “Back then, we all wanted to serve,” he said. As a World War 2 veteran, Geisinger is becoming a rare breed. Only 620,000 of the 16 million Americans who served in World War II were alive in 2016, according to U.S. Department of Veterans Affairs statistics. 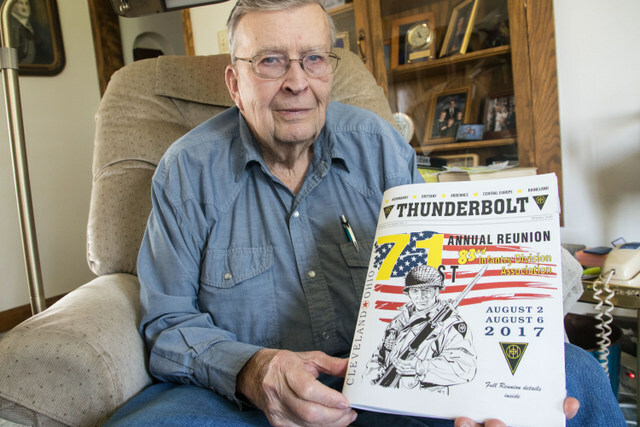 After graduating from Storm Lake High School in 1944, Geisinger was drafted into the U.S. Army on Aug. 2, 1944. “Back then, we all wanted to serve,” he said. Following 17 weeks of basic training in Arkansas, things moved quickly for Geisinger. “As my basic training was ending, the Battle of the Bulge was beginning, so the Army fast tracked us,” said Geisinger, who left on Christmas Day 1944 for Camp Myles Standish in Massachusetts. This U.S. Army camp functioned as a departure area for thousands of U.S. soldiers during World War 2. In mid-December 1944, Germany had launched its last major offensive and intended to split the Allied armies. This surprise blitzkrieg in northwest Europe, which became known as the Battle of the Bulge, did not turn the tide of the war in Adolph Hitler’s favor but did result in American and civilian casualties. The Battle of the Bulge was still raging when Geisinger shipped out for Europe on January 2, 1945. “I was on my two-week ‘ocean cruise,’” said Geisinger, who had turned 19 just a few days earlier on Christmas Eve. When Geisinger and his fellow soldiers with the Army’s 83rd Infantry Division, Company I, arrived at Le Havre, France, they were transferred to railroad box cars bound for Givet, a small community in the north of France, near the Belgian border. “These box cars were called ’40 by 8s,’ meaning they could hold 40 men or 8 horses,” said Geisinger, who recalled that it was close to a month after he left America before he had the chance to take a real shower—not just a saltwater shower on the ship. The Battle of the Bulge was still raging when Harold Geisinger shipped out for Europe on January 2, 1945. Geisinger and his division spent most of their time training in the Hürtgen Forest, located along the border between Belgium and Germany. “Our division was preparing to push across Germany,” Geisinger said. Much worse than the shower situation, however, were the frigid January temperatures and lack of adequate overshoes during the box car ride. “I froze my feet,” Geisinger recalled. After reaching their destination, Geisinger and his division spent most of their time training in the Hürtgen Forest, located along the border between Belgium and Germany. “Our division was preparing to push across Germany,” Geisinger said. In the meantime, however, Geisinger was waging his own battle with a cough that wouldn’t go away. The coughing became severe that he couldn’t eat. On Feb. 14, 1945, he had to go on sick call and was diagnosed with viral pneumonia. Geisinger returned to France and was transferred to a hospital in southern England at Newton Abbot. “I was there two months with no medicine,” said Geisinger, who eventually recovered and returned to active duty. In early May 1945, Geisinger was crossing the English Channel in a ship bound for Le Havre, France, when he heard the news that Germany had surrendered. Although Hitler and the Nazis had been defeated, Geisinger knew he wouldn’t be returning home to northwest Iowa anytime soon. After boarding another box car, Geisinger headed to Bavaria to rejoin Company I and the men he had served with before. That day wouldn’t come for months, however. Geisinger remained in Europe and remembers pulling guard duty along the Danube River. He crossed the river with a buddy one night to meet Russian soldiers on the other side. Geisinger couldn’t access any uniforms other than the one he was wearing. He had no idea why the sergeant wanted American uniforms, although he later suspected an ulterior motive. “I assumed it was for infiltration,” said Geisinger, whose distrust of the Russian sergeant proved accurate as the Cold War heated up. 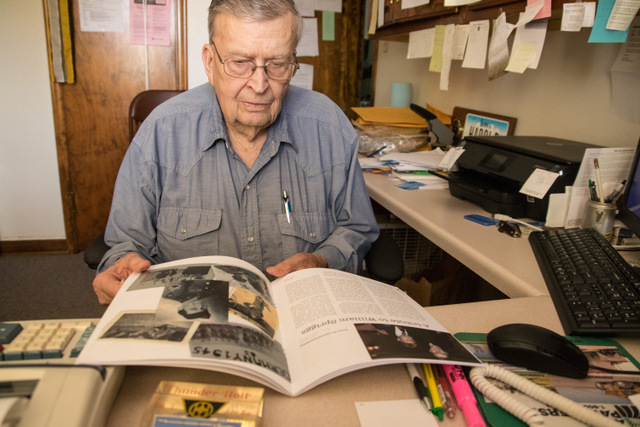 As he sits in his home office, Harold Geisinger looks through pieces of the past, including World War 2 history books. By the time Geisinger was honorably discharged from the Army, he had achieved the rank of corporal. He looked forward to returning to Storm Lake to farm and finally reached home in July 1946. By then, agriculture had entered a new era as the transition to mechanical horsepower from traditional horsepower became complete. New equipment like combines also became more common in row-crop production. Geisinger started farming with his father, L.J. Geisinger, on the Washington Township farm north of Storm Lake that had been in their family since 1915. Geisinger also used the G.I. Bill to earn his pilot’s license and enjoyed flying for many years. Geisinger and his wife, Laura May, a Storm Lake High School classmate, raised their three children on the farm, along with corn, soybeans, hay, cattle and hogs. Farming still interests Geisinger, who helps run the field cultivator in the spring and helps combine in the fall. “I even planted some beans this spring,” said Geisinger, who is proud of the rich heritage of his family’s Century Farm in Buena Vista County. 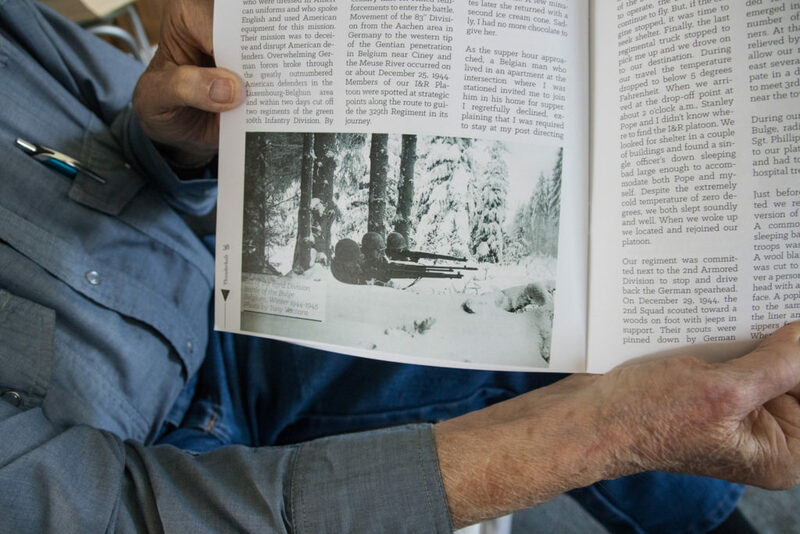 For decades, Geisinger served as a rifleman in the color guard unit in Alta (VFW Post 6172). 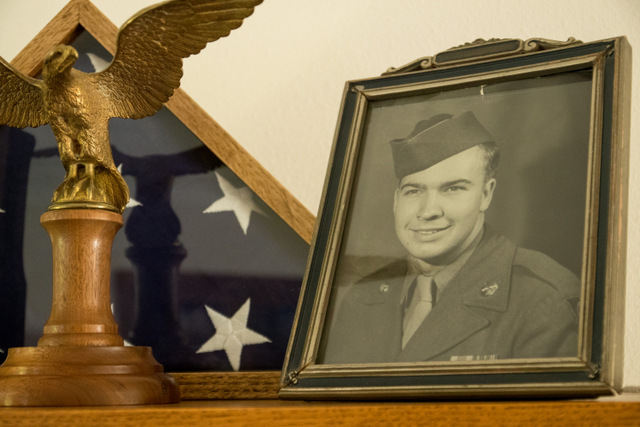 While he has retired from these duties, his memories of World War 2 remain vivid, and he’s proud he was able to serve his country. Harold Geisinger’s memories of World War 2 remain vivid, and he’s proud he was able to serve his country. I invite you to read more of my blog posts if you want more Iowa stories, history and recipes, as well as tips to make you a better communicator. If you like what you see and want to be notified when I post new stories, be sure to click on the “subscribe to blog updates/newsletter” button at the top of this page. Let’s stay in touch. Also, if you enjoyed Harold’s military story, be sure to check out my Memorial Day 2017 post on “How to Thank Veterans for Their Service.” I interviewed two recently-retired U.S. Marines from the Wounded Warrior Battalion, and their insights are invaluable. Lump in throat. So glad he shared his memories with you. Thanks so much, Joy. I’m forever humbled and honored when people like Harold Geisinger trust me to share their stories. These stories must not be forgotten. Thanks you, Harold, for sharing your story. And thanks for your service. You and all the soldiers who fought in WW 2, saved our democracy in order that the generations that followed could live with the freedom we enjoy today.